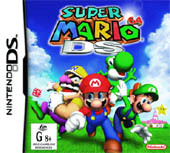 Mario 64 DS is probably the most advanced game for the Nintendo DS at the moment and although it's a remake of the original Nintendo 64 game, there is still enough new content and changes to set this game apart from its predecessor. 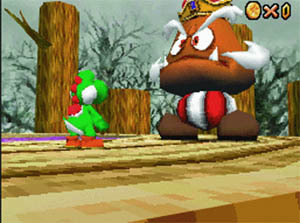 The first time I saw Mario 64 running on a Nintendo 64, I was quite simply amazed at lush and colourful graphics that not only had an amazing storyline but was also one of the most playable games of all time. Nearly nine years since the original release of the title, Mario 64 once again returns on the handheld console market that promises gamers another exciting and thrilling ride through the Mario universe. Building on that foundation of the original game, Nintendo has made a few significant changes to the game to make it something more than just a straight rehash. 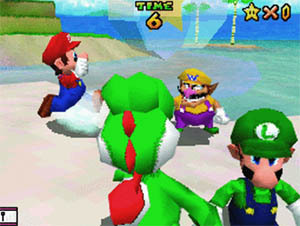 The most obvious is the addition of new characters, besides standby Mario, players can also take control of Yoshi, Luigi and an unusually sociable Wario. Each has his own set of skills and specialties that should feel perfectly comfortable for anyone who has ever played with these characters in previous adventures, and it adds a nice twist to the action. The game world is also expanded as there are more areas to explore and more secrets to unravel. The perfectly-designed progress system of gradually unlocking new areas is still present, allowing you to move freely from area to area and never penalizing you for getting stuck on a quest or two. Peach's castle has been slightly renovated to make room for more areas, thirty extra stars, as well as mini-games and other random secrets. And Mips the rabbit seems to have multiplied, so you'll spend a great deal of time chasing bunnies all over the castle to snag keys that will unlock these new features. Mario, Luigi and Wario are all playable too, once you've rescued them, all have very similar moves, with only a few minor differences to set them apart. Mario has all his old moves back that include jump, punch, back flip, triple jump, etc. Luigi can jump really high and Wario can smash things that the other two can't. The control system of Mario 64 DS is a little awkward at the best times because the stylus is actually rather fiddlesome in controlling your characters and you will generally find yourself going back to the D-PAD to control your characters. However, the addition of mini games which are unlockable in the main game by catching rabbits adds to the replay value, and gives you an idea of how the touch screen can really benefit portable gaming. There are three sound options Mono, Stereo and Surround. SM64DS defaults to Surround, and it sounds great, you can hear an enemies location clearly, even on the DS's little speakers. The speech samples are a little compressed and that can be noticeable at times, the music however sounds perfect. Graphically the game looks much better, partly due to the DS's smaller screen, but also because the character models have been updated, and are much more detailed then the originals Mario model with his octagon hat. There are more textures used now and less bright colours. The DS lacks the texture filtering of the N64 so close-up textures appear slightly blocky but on the DS's screen it's not really that noticeable. The framerate is as smooth as it ever was on the N64, and the character animation looks much smoother, so all in all SM64DS looks fantastic! Mario 64 DS also supports a great Multiplayer mode for 2-4 players which is a great added bonus, and certainly much more fun than the Mario Bros Vs game included with the Super Mario Advance games on GBA. It only requires a single game card for up to four player. The aim of the Vs mode is to find as many stars as you an in the time limit, there are four stages, all taken from the main game, whoever finds the most stars wins. Simple but fun. In conclusion, Super Mario 64 was possibly the greatest game ever made back in 1996, and this handheld adaptation is still a great game, perhaps to as perfectly suited to its system's input the way SM64 was with the N64's analog stick. Highly Recommended!